WASHINGTON (February 24) -- First lady Hillary Rodham Clinton met with two prominent New York Democrats on Wednesday as she continued her deliberations about whether to run for the U.S. Senate in 2000. Sen. Charles Schumer and Rep. Nita Lowey were among those attending a White House meeting with Mrs. Clinton. Also on hand was former Deputy White House Chief of Staff Harold Ickes, a veteran New York and national Democratic strategist who is close to the first lady. Lowey, who is also considering running for the seat, said she respected the first lady's schedule for making a decision, but refused to describe that time frame. Lowey said she was not urging Clinton to make a quick decision saying it will take some time for her, and she is sure that if the first lady runs she will win. "I wanted her to know how much Democrats in the caucus of the United States Senate would welcome her candidacy," Torricelli said following the meeting. 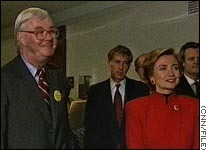 Mrs. Clinton has already met with the current occupant of the Senate seat in question -- Sen. Daniel Patrick Moynihan, who is not seeking re-election in 2000. A close political adviser tells CNN the first lady is "slightly more inclined than disinclined" to run at this moment, but said it was unclear how far along she was in her deliberations. This source is among those urging Mrs. Clinton to make her decision sooner rather than later -- so that other Democrats have time to organize and raise money if she decides against running. And there's more encouragement for the first lady in the latest New York Poll: She has a commanding 18-point lead over New York Mayor Rudy Giuliani, who would be considered the Republican front-runner if he decides to run. Mrs. Clinton's lead is considerably larger than it was just three weeks ago. While Mrs. Clinton could be a formidable candidate, she may be doing the GOP a favor by just considering a Senate run. The National Republican Senatorial Committee is already developing an anti-Hillary fund-raising campaign they hope to launch within a week, regardless of whether or not she runs. Giuliani is in Washington this week and his fellow Republicans have rolled out the red carpet. He has been invited to testify before Congress about his record on crime and drugs, to share a platform with new House Speaker Dennis Hastert and to keynote a breakfast for Hispanic Republicans. When asked if he had any plans to run for president, Giuliani quipped, "Any consideration of running for president of the United States or of my co-op board?" "No, I think the decision I should make is about the Senate," the mayor concluded. CNN's John King and Jonathan Karl contributed to this report.